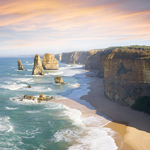 Tag Archive for "Twelve Apostles"
Look at the tweet below and you’ll understand what it feels like to experience the beauty of Australia.Below are 16 amazing photos to trigger some of that awe inspiring delight right now!Our Destination Experts can help you plan the perfect trip to Australia. Customize your trip and start jumping for joy. The Ningaloo Reef in Western Australia is the only place in Australia where you can swim with the majestic Whale Shark. The Whale Shark is the largest known fish and can grow up to 42 feet long. Unlike most sharks, they are filter feeders with huge toothless mouths. These giant pools have been a landmark of Bondi Beach for over 100 years! There is a large pool for lap swimming and a smaller pool for the kiddos. Its a great way to experience one of Australia’s most beautiful beaches during the winter. The pool is open 6am to 6:30pm, Monday through Friday, 6:30am – 6:30pm on Saturday and Sunday, and is closed for cleaning on Thursdays. It’s only $6.50AUS for adults & $4.50AUS for children. When visiting the Great Barrier Reef in Australia, don’t forget to bring an underwater camera. Whether you’re diving or snorkeling, you’re sure to run into many members of the large diverse aquatic life population, like this Green Sea Turtle. Six of the world’s seven marine turtles can be found on the Great Barrier Reef. 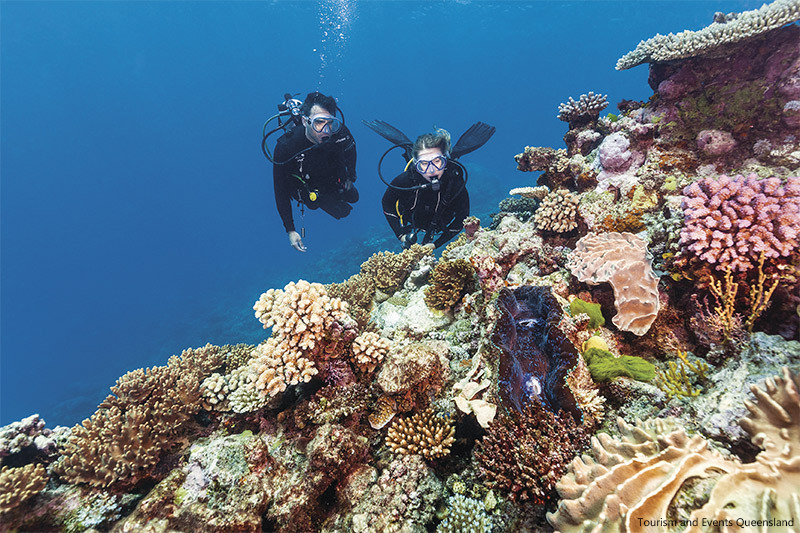 Sitting right on the Great Barrier Reef, Lizard Island has some amazing views and uniquely diverse diving conditions. Forbes.com recently published an article about the Luxury Resort of Lizard Island, saying it “may be one of the most beautiful place in the world.” The resort, complete with a recent 46-million dollar renovation, is absolutely stunning. With 24 sandy white beaches and 1,013 hectares of National Park, it’s really easy to get away from it all. These friendly “puppies of the sea” can be found in many waters off the coast of Australia. This photo was taken in the crystal clear water of Seal Cove. So adorable! Byron Bay is a popular vacation spot among the Aussie population. So you know it’s good! It’s a laid back, new-age utopia kind of town with miles of picture-perfect coastline. Great for families, friends, couples and shutterbugs. Every night a parade of little penguins marches across Summer Land Beach. 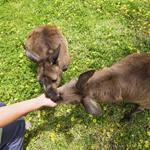 Phillip Island in Victoria is home to an estimated 32,000 breeding pairs. As you can imagine, this is a very cute sight to see! This amazing photo was taken off the coast of Queensland’s Sunshine Coast during this year’s Humpback migration season (July – October). It’s amazing to see calves swim along side their mums. Wineglass bay, located on the Southern edge of Tasmania, is located in Freycinet National Park. These perfect contours, turquoise water and pure white beaches exist on any normal day while you’re on Wineglass Bay. Every year thousands of baby turtles make their way to the ocean for the first time. Turtle nesting grounds can be found all over Australia’s coast. Near the Great Ocean Road in Victoria in Port Campbell National Park, you’ll find a collection of limestone stacks just off the shore. There are only eight apostles now, after the ninth one dramatically collapsed in July of 2005. Interesting fact: There were never 12 stacks, as far as we know. Considered an Exmouth local and regular around Ningaloo Reef, Augie the Orca is known for putting on a show. He’s been spotted multiple times performing for crowds on cruises around the reef. Fraser Island, the world’s largest sand island, is a nature lover’s dream. Activities available include 4×4 next to the sandy cliffs, hike through the rainforest, meet native wildlife, whale-watch, comb the beaches, visit shipwrecks, and swim in freshwater lakes ringed with gold. The photo above is of the island’s most famous shipwreck, the SS Maheno. It was one of the first turbine-driven steamers. Tangalooma is the only place you’re practically guaranteed the opportunity to feed wild bottlenose dolphins during your stay. Each night at sunset up to 10 wild dolphins visit the shores of Tangalooma and everyone is invited to feed them a treat. The feeding program runs with strict guidelines to ensure the health and safety of the dolphins, but everyone still enjoys this magical experience. You might recognize this scene from TV and movies. The Heart Shaped Reef, in Hardy Reef, is a great place for snorkeling and scuba diving. You can see this lovely sight from a helicopter or plane tour. Bremer Island is at the topmost end of Australia in the Northern Territory. It’s the perfect place for a remote wilderness retreat, world class fishing, learning about the Yolngu culture, and getting away from it all. There are so many amazing sights to see on and off the coasts of Australia. As they say, pictures just don’t do it justice. You have to see it for yourself. Are you ready to start planning your tip to Australia? Located just off the shore of Port Campbell National Park in Victoria, Australia, is this breath-taking limestone stack known as The Twelve Apostles. If you’ve ever heard of the Great Ocean Road in Australia – The Twelve Apostles is one of the monumental moments along the scenic drive. These magnificent towers keep watch over the Southern Ocean and have become icons of Australia. As the years have come and gone the stacks have withered to the eight that remain strong and triumphant. This destination is one of those “can’t miss” moments because these limestone wonders are literally challenged daily to withstand the high winds and waters that relentlessly beat against them. The most recent stack that fell was in 2005. When visiting The Twelve Apostles be sure to inquire about the shipwrecks and history that surround these natural wonders. 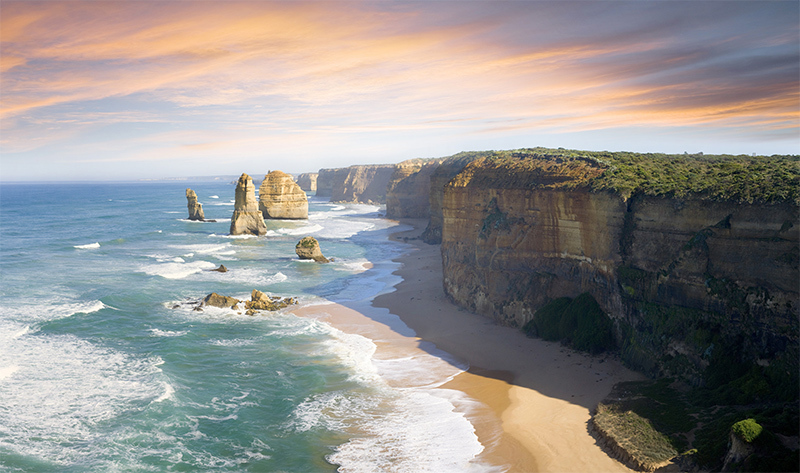 If you’re taking a drive along the Great Ocean Road – be sure to plan extra time to take a romantic stroll at sunset to see the Apostles Stacks up close and personal. It’s a great once-in-a-lifetime photo moment. A day trip to the Twelve Apostles can take a bit of planning. The best way to take the trip is from Melbourne. We’ll help you plan your stay in Melbourne and your drive on the Great Ocean Road so you don’t miss this spectacular sight. I Want to See the Twelve Apostles!